In anticipation of Halloween and the shorter Alaskan days, this week’s story time was all about the dark. Before I detail the program, I’ll just say some storytimes are better than others. Despite hours of planning and prepping, sometimes the program doesn’t turn out like you hoped. This was one of those weeks. The program wasn’t bad, but it wasn’t awesome. And, I thought it was going to be AWESOME. Why wasn’t it? I think there were a couple of reasons. This story time needed the story portion of the program to link with the activity portion so kids could better make the connections between the two. This was hard to do because we had a guest who played music and read stories during the first portion of story time, while I led the activity portion. While we do have guests come occasionally, this week’s plan wasn’t the one to use with a guest who only comes occasionally. The other reason I think this week wasn’t as successful as it could have been was that by the time the activity portion of the program started we had lost the attention of many kids and parents. This may be due to reason #1. So explaining the activities, or even engaging some of them, was a challenge. This week’s program was a great example of the need for consistency, the importance of trained storytime presenters, and yes, the need for better, if not just different, planning. 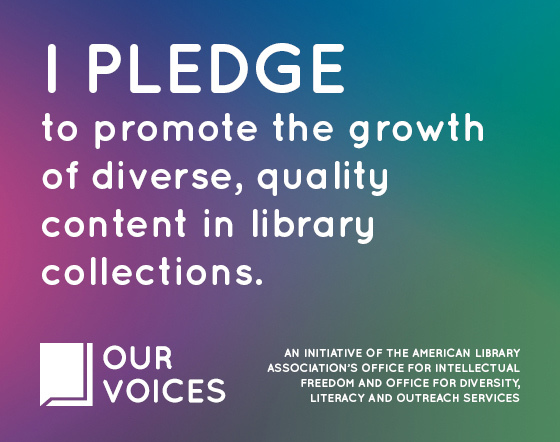 How do you incorporate volunteers into storytime? Even though the children’s library isn’t completely dark (thankfully there are a lot of windows) we made darkness! 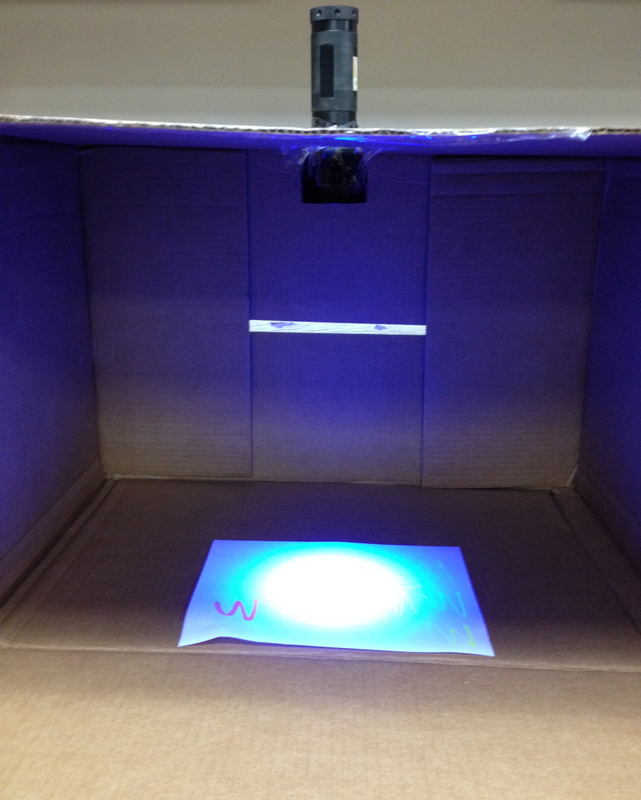 I found this great idea for a glow in the dark art box that let me explain a little about light, ultraviolet light in particular, fluorescence, and how black lights work. To make the two glow in the dark boxes, I first taped one end of each box open so kids and adults could draw with their heads, or at least their arms, inside the box. Then I cut a hole in the top of the box just smaller than the light end of the black light so that it would fit tightly. I then taped around the black light inside and outside of the box so it wouldn’t fall on someone’s head while they were drawing inside. It was that simple. I set up the similar boxes with lots of room surrounding them, one on the floor and one at a table, so the glow in the dark artists had space to get comfortable. While the boxes initially made many wonder about them, it wasn’t until the other crafts were done that most kids and caregivers wondered over to explore. Once they did, the kids were mesmerized! The littlest ones actually climbed inside to draw, while the bigger storytimers only tucked their head or hands inside with their artwork inside the box. Either way glow in the dark creations of all kinds were made. These boxes were fun and both demonstrated activities that could be easily recreated at home and how to explain ideas not typically thought of as preschool topics, increasing vocabulary. Speaking of vocabulary and early literacy, have you seen the report about the importance of a diverse vocabulary in kids as young as 18 months and its effects on literacy later on? The younger kids enjoyed the glow in the dark sensory bags that I had available at the next station. I made enough for families to take home with them where I am sure the real fun started. 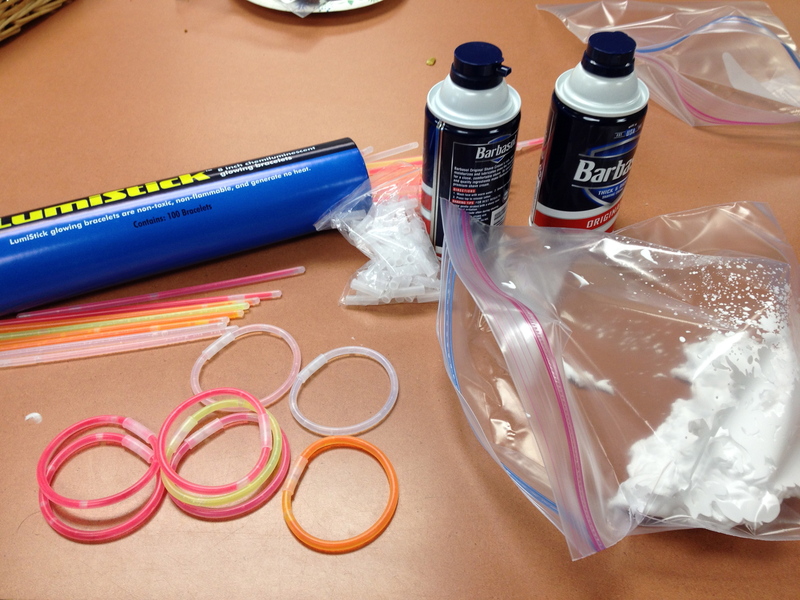 These gallon size ziploc bags were filled with shaving cream and two glow in the dark bracelets (activated). Kids could play with the sealed bag, find the hidden bracelets, and trace the shape of the bracelets to strengthen their important finger muscles they use for coloring, cutting and soon writing. This was the perfect craft for this week’s program. It was easy for parents to figure out while I was busy with the other activities and kids could modify it however they wanted. Some added more legs or used different colors of pipe cleaners. Others added more eyes or more letters. Some kids even colored the black spiders. 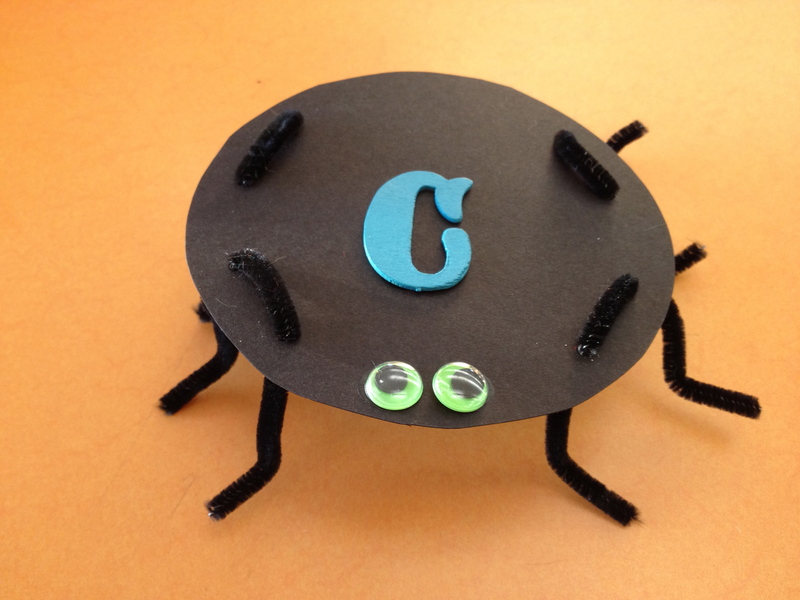 For those who didn’t want to make a spider, paper, markers, crayons, and scissors were available.